I used to wear normal running shoes for all of my rides, and I thought that clipless pedals were overkill. Recently however, between taking a spinning class, and the recommendation of a friend, I decided to give them a try. Wow, what a difference! I started out on my biking adventure pretty casually. In fact, I wasn’t even sure this whole biking thing would “stick”. I figured maybe it was just a phase. Obviously, if you read this blog, you know that it wasn’t just a phase, and that biking has become a regular part of my life that I really enjoy. Part of my casual start of biking was just wearing normal shoes to ride. My Schwinn Midtown that I picked up at Costco just had normal pedals. In fact, I’m not even sure I knew what clipless pedals were. 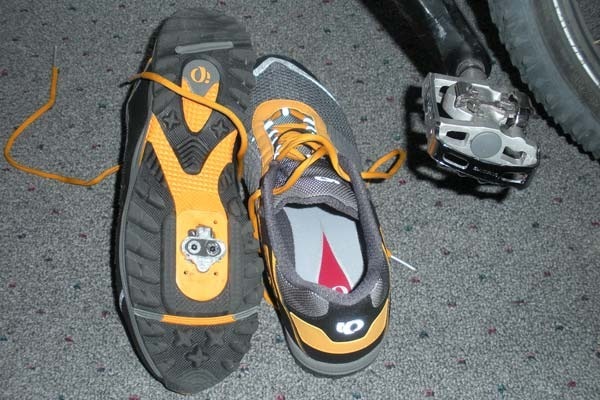 I had seen the old school pedals with straps on them, and had heard that serious bikers wore special shoes, but I had no idea how they worked. Although, as I started to learn more about modern bicycles it wasn’t long before I started encountering this strange concept called clipless pedals. Anyway, regardless of what you think of their name, I have now become a believer in a clipless pedal system. It all started when I decided to try taking a spinning class at a local fitness center. I immediately noticed that the bikes has clipless pedals, and that most of the “regulars” in the class wore biking shoes and clipped in during their workout. I guess the peer pressure kind of got to me and I started thinking about getting some biking shoes for the class. Around this same time I talked with a friend who has been bike commuting for a number of years, and when he found out that I wore normal shoes to bike, he strongly recommended that I give clipless pedals and shoes a try. At this point, I was convinced, but then I began to price a clipless system and quickly realized it wasn’t going to be a cheap endeavor. I also figured it was a pretty big investment if I ended up not liking them. About this same time I got my annual dividend back from REI, as well as a 20% discount coupon. REI also had some pedals on sale, so I decided to go for it. I went to my local REI, and they had a decent selection of shoes to try on, as well as some very knowledgeable and helpful salespeople. After trying on several different styles of shoes I decided on the Pearl Izumi X-Alp Seek shoe. One of the things that was kind of overwhelming about clipless systems is that there are many different kinds of cleats to choose from. I didn’t really know anything about the different systems, but it seemed like I had seen Shimano SPD cleats mentioned a lot. The folks at REI confirmed that most spinning cycles had SPD pedals, and that SPD was a very common system. So when it came to pedals, I decided on the Shimano M324 Combo pedal which had SPD cleats on one side and a normal pedal surface on the other. Since they are double sided I can still ride them with normal shoes if needed. Here’s a picture of the shoes with the cleats installed, and the combo pedal. The next step in the journey was getting used to riding while clipped into the pedals. I had heard a few horror stories about people not being able to get unclipped when they stopped so they fell over. Several people even went so far as saying that “you will fall over, it is just a matter of when and how many times”. The friend who had recommended going clipless encouraged me to go ride around a field for a while and practice clipping in and out a whole bunch. Well, I was so anxious to try my new shoes and pedals that I completely ignored that advice and decided to just try them on my Monday morning commute. I started out slowly, using the non-clip side of the pedals until I got up to speed, and then clipping in. Every time I had to stop I clipped out early, and made sure I was ready to stop. That first day was great, and I figured I had this thing all figured out. Well, it didn’t take long before I was humbled. After a couple of days I decided to run over to the grocery store to pick up a couple of things, so it was a casual trip, and I wasn’t riding very seriously. I got to a big intersection that really requires me to cross in the crosswalks like a pedestrian. When I pulled onto the sidewalk to push the “walk” button for the stoplight I got off balance and couldn’t unclip in time. I fell over “in slow motion” on the sidewalk! It was Saturday afternoon, so the intersection was full of cars, and I was embarrassed. My ego was the only thing that was bruised though, so I popped back up quickly, trying to smile and laugh at myself so that everyone knew I was okay. The funny thing is, I didn’t see anyone watching me, and I’m not even sure anyone noticed. So, after all that, what’s the big deal about a clipless pedal system? I have to say that I didn’t “get it” until I tried them, but the difference is amazing. One of the best ways I can think of to explain the difference is that it is like you mechanically “become one” with your bike. Your feet and legs become extensions of the crank arms, and just like the push rods on a real engine, you can apply power through the entire circle of your stroke. I immediately noticed that I felt a lot stronger and more efficient. It was much easier to stay in a faster gear, especially when climbing. I also noticed that all of the muscles in my legs were getting a workout, not just my quads. In fact, initially this was uncomfortable, and I’ve been a bit sore, but I think this is much better overall because my legs are getting a more balanced workout. If you’ve never thought about it, I would encourage you to give clipless pedals a try. UPDATE: I wrote another post with more detail about clipless pedal systems here. I am glad to hear that I am not the only one with hesitation with switching to clipless pedals. 1. Cost. The fear of making the equipment investment and then finding out that they don’t work for you. 2. The fear of breaking my neck attempting to use them. Glad to hear that you made it past your concerns. Now after reading your post, I feel like a chicken sh@# and should man up and make the attempt. The best advice I can give is to just enjoy riding your bike and don’t stress over it. If you can go clipless I think that’s great, but if not, then just enjoy what you’ve got. That was you??? Ah, just kidding. I’ve never tried clipless. But, I have been riding with friends and gotten a kick out of their “slow motion” falls. I don’t recognize the carpet in this picture…where were you?? Did you recarpet some part of the house that I am unaware of? I practiced with my new clips the other day then went straight out on a ride. I got as far as the front garden when I stopped and couldn’t unclip in time. I fell over getting the handlebar end slammed into my chest. I had to take the day off work today because of it. It’s funny now but really brings home an important lesson – practice, practice, practice! Chris, I’m glad that you are okay, and can laugh about it now. I’m sure that things will get better as you practice. I was riding my friend’s road bike yesterday, and his bike has a different clipless system that I’m not completely used to yet. I was trying to clip back in after stopping for a traffic light, and got in a hurry, and my foot slipped off the pedal sideways, and I got a nice gouge in my shin. Not a big deal… like you say… practice, practice, practice.